Geology and paleontology have a lot in common: they complement each other, they concern themselves with vast expanses of time, and they're both relatively new disciplines. Geology not only helps us study the history of life on Earth, it enables us to comprehend events beyond our control, such as earthquakes and volcanoes. Oddly enough, continental drift, the mechanism causing earthquakes and volcanoes, was not widely understood until the 1960s, even though Alfred Wegener described the process in 1912, and Abraham Ortelius suggested the possibility in the 16th century. 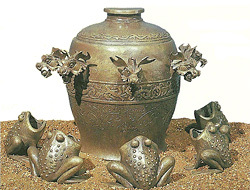 Ever seen an ancient Chinese seismometer? That's what this is. Each tremor causes a ball to drop from the griffin's mouth into the frog's. Not exactly the accuracy of the USGS, but not a bad idea, either. Frequent, deadly earthquakes caused the Chinese to try detecting seismic activity starting in the second century AD. 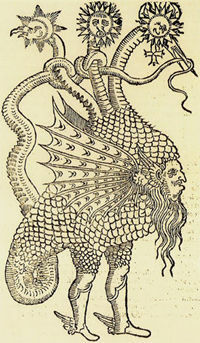 Europeans frequently portrayed fossilized creatures as instruments of the devil, along with goats, potions and witches. Fossils were said to have been "begotten by Satan to vie with God," a charge some biblical literalists still level today. 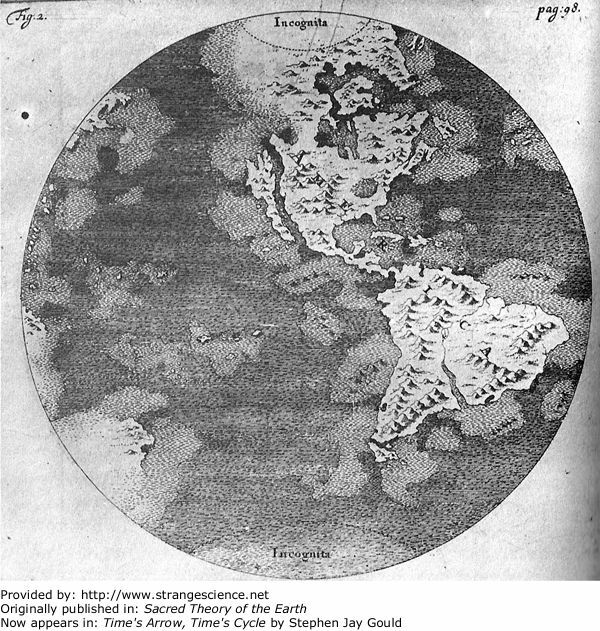 Originally published as: "Map of the square and stationary Earth: four hundred passages in the Bible that condemn the Globe Theory, or the Flying Earth, and none sustain it; this map is the Bible map of the world"
Christopher Columbus knew better than to fear sailing off the edge of the Earth, though the worry was somewhat understandable in the 15th century. But 400 years later, South Dakota businessman Orlando Ferguson remained unpersuaded by centuries of circumnavigation of the globe, including the ocean voyages one suspects carried his own ancestors from the Old World to the New. All the evidence he needed came from his Bible. In this map, Ferguson has stationed angels at each of the Earth's four corners. Off to the right, Ferguson tries to show the implausibility of heliocentrism, showing desperate men flapping from a speeding planet. North and South America — little discussed in the Bible he cites as evidence — nevertheless appear in the middle of Ferguson's map. 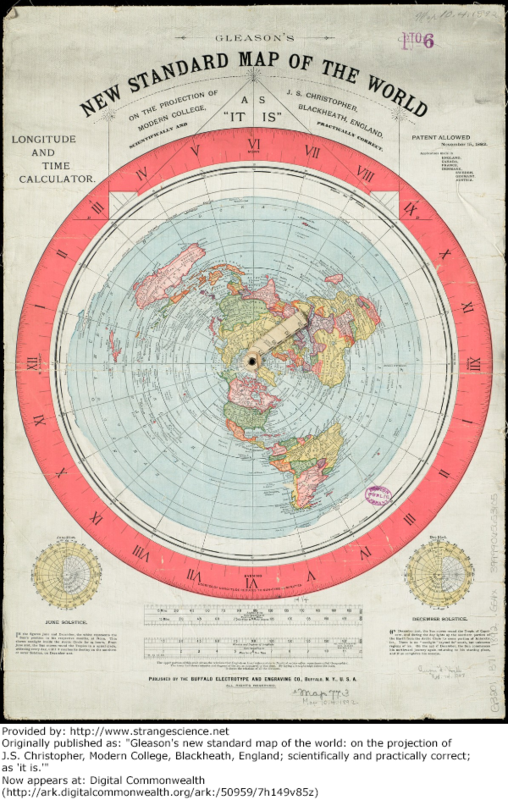 Originally published as: "Gleason's new standard map of the world: on the projection of J.S. Christopher, Modern College, Blackheath, England; scientifically and practically correct; as 'it is.'" 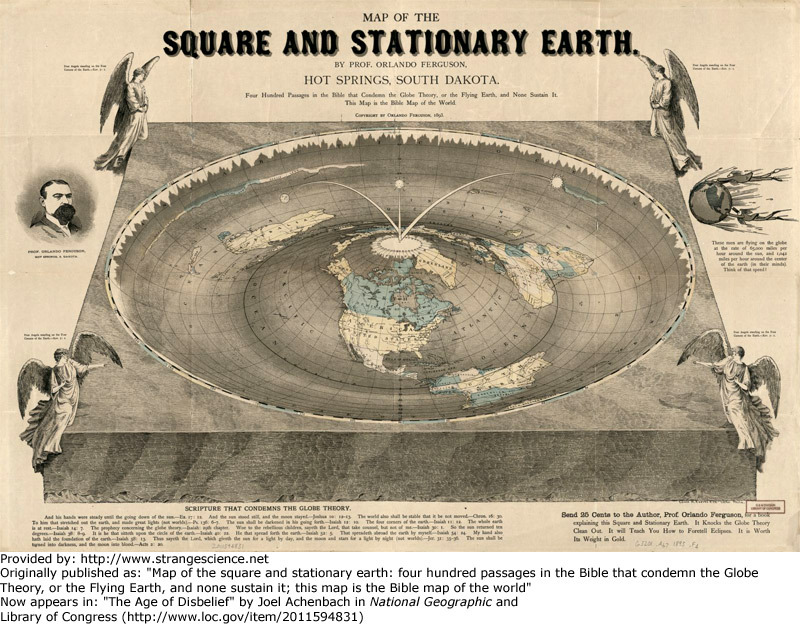 The year before Orlando Ferguson published his square-and-stationary Earth map, Alexander Gleason gave the globists a piece of his mind. Gleason was a civil engineer from Buffalo, New York. He was also the author of Is the Bible from Heaven? and Is the Earth a Globe? Regarding the second question, Gleason's answer was apparently a big "no." 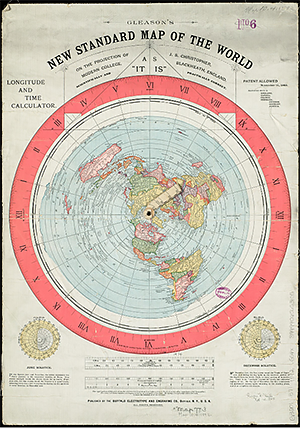 Gleason's work remains popular with flat Earthers and conspiracy theorists in the 21st century. The globists can point to better evidence: orbiting satellites, images captured by sensors on those satellites, pictures of our planet snapped by Apollo astronauts (but if you're a flat Earther, you probably figure the Apollo Mission's a hoax too). Too bad for flat Earthers, globists win the pithiness contest: If the Earth were flat, cats would have pushed everything off the edge of it by now. Evidently influenced by the work of Benjamin Waterhouse Hawkins, this panorama depicts what Duncan referred to as "singular productions of former times." 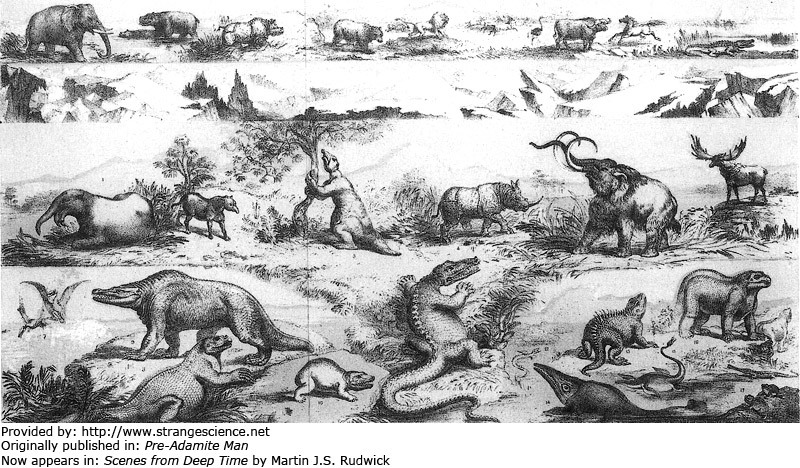 The illustration shows Duncan's presumed history of life on Earth from primeval monsters (bottom) to contemporary, familiar animals (top). Visually, the picture makes no attempt to show any gap between the Age of Reptiles and the time of big mammals. Rudwick notes that "the lizardlike iguanodon pokes its snout out of the Secondary into the Tertiary!" But in this picture, the Pleistocene Ice Age provides a life-free break between the past and present, echoing arguments of Louis Agassiz that it was a life-erasing catastrophe. Duncan wrote of "that singular crisis in the history of our planet where a destructive glacial influence in supposed to have invaded the Earth and to have put a sudden end to life, both in the vegetable and in the animal kingdom — a crisis which occupies a somewhat conspicuous place in our pre-Adamite theory." She didn't originate this "pre-Adamite" theory. In 1655, Calvinist lawyer Isaac La Peyrère published Men Before Adam , claiming not only that men existed before biblical Adam, but also that the Chaldeans could trace their civilization back 470,000 years. In the mid-17th century, his claims were met with a mixture of anger and wry amusement by religious authorities. Duncan's book resuscitated La Peyrère's argument about ancient peoples, but by the time she penned her book, ancient tools such as flint axes had turned up suspiciously close to the bones of extinct mammals. But, hard as they may have been to survive, the punishing conditions of the Pleistocene didn't destroy all life on Earth. Chaldean civilization hardly persisted uninterrupted for over 400,000 years, but ancestors of modern humans managed to eke out an existence over an even longer timespan. Among the more affordable science books in mid-19th-century Britain were wee volumes suited to tiny hands and young minds. 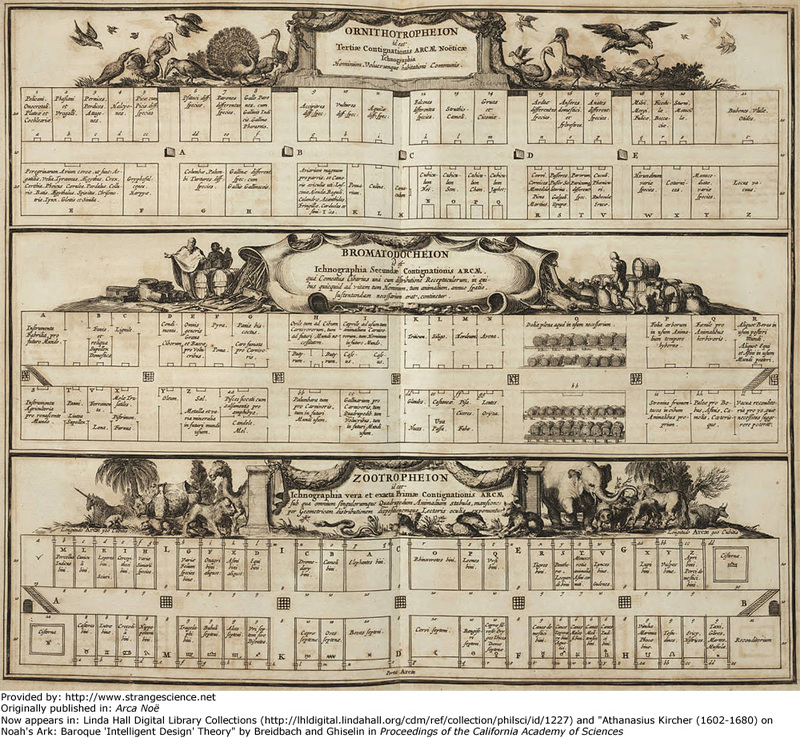 The Whipple Library Books Blog explains that one of these books, First Lessons on Natural Philosophy , carried religious overtones, and used a question-and-answer format to relay information, such as, Q: What are the benefits of wind? A: Moving ships around the world, and blowing away bad air that causes illness. In contrast, The Little Geologist and The Little Mineralogist paired straightforward text with illustrations, such as this small menagerie of fleshed-out fossil animals. The illustrations are nicely done for such an affordably priced book, though they are pretty recognizably borrowed from earlier fossil reconstructions. The image on the bottom is George Cuvier's articulated Megatherium. 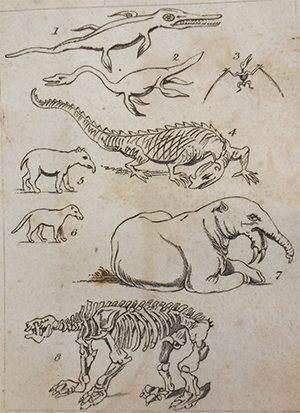 The reptiles in the top half of the image are from figures in William Buckland's Bridgewater Treatise contribution ( Geology and Mineralogy Considered with Reference to Natural Theology ) including a cute but inaccurate Iguanodon. This prolific hillside gives rise both to vases and animals, all of them emerging from gaps in the ground. An enduring belief in Europe that persisted into the Renaissance held that the Earth had creative powers of its own and could make living organisms, or at least objects that looked like them. Fossils — which sometimes looked recognizable but turned up in the wrong place, such as a shark tooth or seashell in the side of a mountain — often contributed to the confusion. Today we associate "meteorology" with the study of the atmosphere and weather, but during the Renaissance, the term had a broader definition, including the combination of elements (earth, air, water and fire). 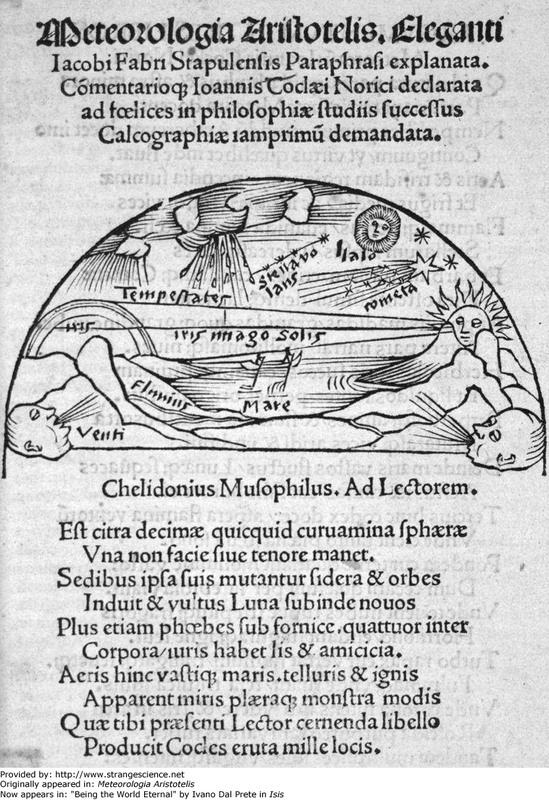 This woodcut shows the elemental interactions studied by 15th- and 16th-century meteorologists. Works such as these contained plenty errors, but they also included something we don't often attribute to medieval and Renaissance Europeans: acceptance of an ancient Earth. Meteorological works such as this frequently discussed the planet's long history. In this book, Lefèvre mentioned the Noachian flood only to say that it "does not pertain to nature, but to divine revenge." He was in plenty of good company. In 1542, Fausto da Longiano rejected the universality of Noah's flood and endorsed a 36,000-year cycle accepted by many other scholars at the time. Nearly two centuries earlier, Jean Buridan of the University of Paris had already rejected that same 36,000-year cycle as too short. In other words, the biblically literal creation date of 4004 BC publicized by James Ussher and still influential among many creationists today was largely born in the 17th century. Embroiled in the Reformation and Counter-Reformation, religious authorities and scholars came to believe that taking the Bible seriously meant taking it literally. Yet about the same time biblical literalism was taking hold, it was also being undermined. Niels Stensen (Steno) discovered that rocks are deposited in layers with older rocks underneath newer ones. Over the next couple centuries, the oddness of the fossils found in older rocks (and the dearth of human remains found in those layers) enabled savants and geologists to piece together an ancient history for our planet, overturning the young-earth literalism of the 17th century. This engraving of a fossil fish was beautifully detailed and probably accurate. What missed the mark was Scheuchzer's characterization of this and other fish fossils as "The Different Fish that Died in the Great Flood." Cabinets of curiosities had existed as motley collections of unrelated fossils, plants, shells, coins, artifacts and fakes for many years by the time Dutch collector Levinus Vincent and his wife Joanna van Breda assembled their collection. But their cabinet was different. Historian Bert van de Roemer argues that Vincent intended to "emphasize the wonder of God's creations by restoring the natural world to its prelapsarian harmony." In other words, Adam and Eve's biblical fall basically broke nature, and Vincent and his wife intended to restore it through a meticulously arranged cabinet. (They weren't alone in thinking this way; some of the enthusiasm for inventions such as microscopes and telescopes stemmed from the belief that those tools would restore the superior senses humankind used to possess.) The wonder cabinet included some 600 vials of animal specimens preserved in alcohol. Besides living in an age when natural historians relied on the Bible to interpret the planet's history, they also believed that all of life's diversity could be assembled in a single collection. Other goodies in the collection included shells and insects artfully arranged in patterns resembling lace or embroidery. As Van de Roemer explains, this was no coincidence. Vincent wasn't just a collector but also a damask merchant and fabric designer. In the late 18th century, savants were beginning to realize that the Earth had an ancient past, but it wasn't clear to everyone that the ancient past preceded humans. One savant who believed that humans had been around for a very long time was Lamanon. This illustration shows fossils reportedly found in the gypsum remains of an ancient lake near Paris. Two of the fossils look credible to modern eyes: the fossil tooth and the fossil fish. Lamanon characterized the tooth as that of a mammal that was likely extinct. The bird appears, in Rudwick's observation, "suspiciously well preserved." But more suspicious still is the key. The key's presence in this collection of fossils was based on the word of a quarryman who claimed to find the key 80 feet deep in the gypsum deposits. He produced not the key itself but a drawing of it in the sand. Since the quarryman seemed sensible, his account was believed. Lamanon wrote, "I therefore consider it certain not only that the existence of men preceded that of the present surface of the region around Paris, but also that the shores of this lake of selenitic waters were inhabited by men living together socially and that in their time the art of working mines and forging iron was already known. I know of several other facts analogous to this, which prove incontestably that the crafts were cultivated in the times that precede the great physical revolutions that have happened at the surface of the globe." Perhaps the sensible quarryman's account was so easily believed because it so easily fit with what some savants very much wanted to think. German Jesuit Athanasius Kircher was a polymath who studied everything from magnetism to comparative religion. At a time when boundaries had not yet been drawn between science, religion and art, Kircher mingled these things to spectacular (if not entirely accurate) effect. 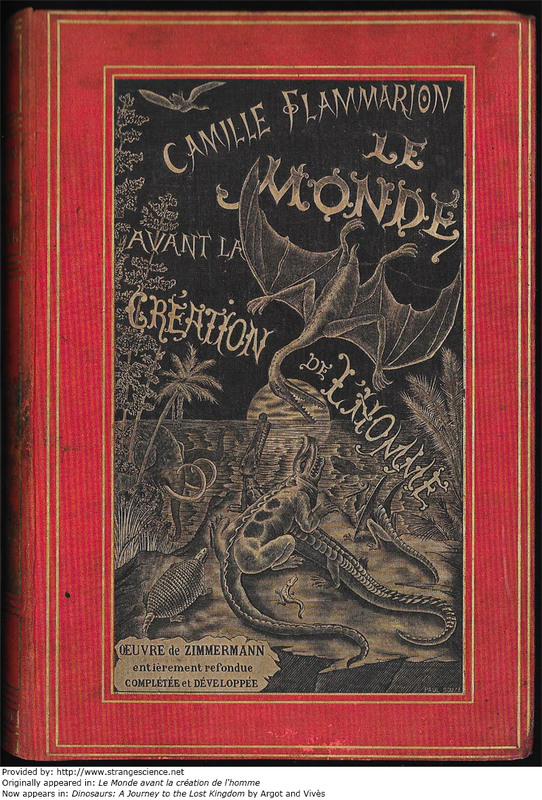 During the 1660s and 1670s, he published two volumes of Mundus Subterraneus ( The Subterranean World ). The volumes covered gravity, the sun and moon, eclipses, volcanoes, ocean currents, weather, minerals, fossils, astrology, dragons, demons, alchemy, spontaneous generation and fireworks, among other topics. 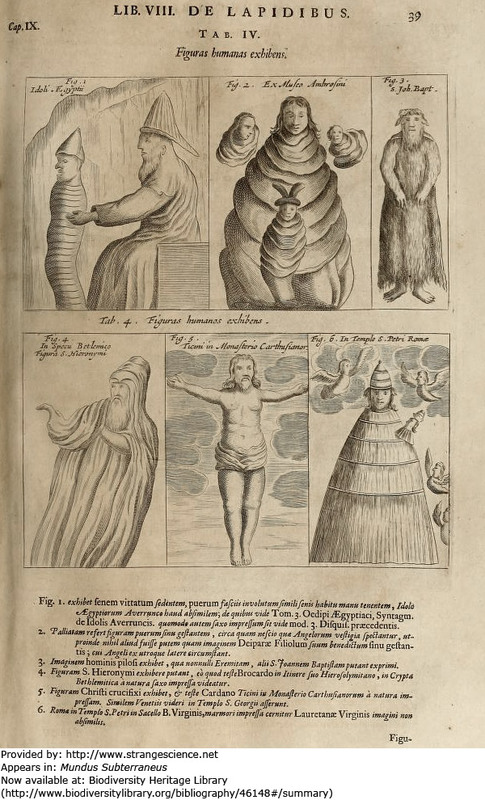 To explain the uncanny resemblances these stony images bore to birds, Kircher suggested a few possibilities, including chance, petrifaction, and divine disposition enacted by angelic and/or natural forces. 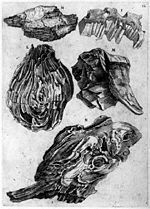 Although the 17th-century scholar Kircher was often wrong about how fossils formed, he wasn't wrong every time. He provided a description that a modern scientist might accept when it came to these fossil fish. 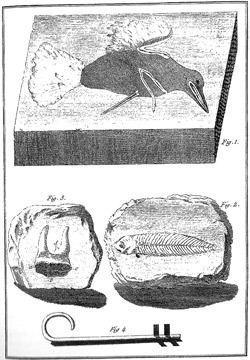 Kircher argued that when, say, a fish is encased in mud, a "lapidifying spirit" gradually turns the fish to stone. He further argued that the fish's internal organs and other soft tissues are consumed, or perhaps turned to dust. Although these fossil fish bear humanlike faces and more soft tissue than one could realistically expect from the fossilization process, Kircher's arguments about the process were cogent. 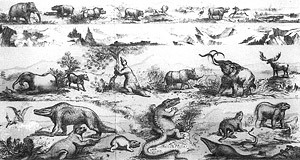 Figured stones Kircher described in his Mundus Subterraneus also included quadrupeds (four-footed animals). Two examples appear here. The quadruped in the rock on the left looks like it has taken a beating (though the animal on the right looks a little too perfect). 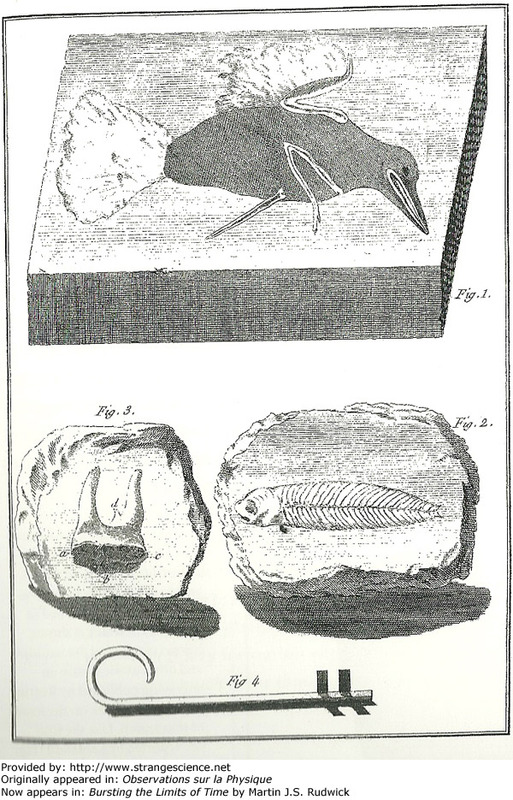 Although Kircher's figured stones may have been completely inorganic — with their figures enhanced by Kircher's imagination — the busted-up appearance of some of the quadrupeds in Kircher's figured stones aren't unlike the fragmented nature of some fossils, which may suffer anything from trampling to the crushing weight of rocks overhead to erosion. 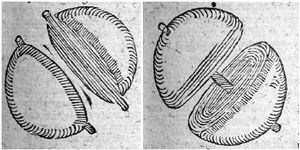 Natural processes certainly can produce patterns that human eyes interpret as pictures, but Kircher likely overinterpreted. 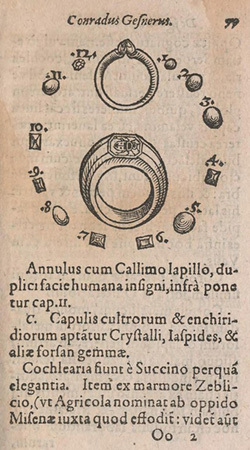 In an age when crystals might be classified as fossils, Athanasius Kircher tried to understand the formation of both. Being mathematically inclined, the Jesuit polymath marveled at the regular geometric forms in the rocks he found, just as he admired the formed stones resembling people and animals, but he couldn't offer anything like a modern explanation. Instead, he wrote about forces, natural appetites, rays, even spirits. This illustration shows what's called a "ruin marble": a marble with contrasting patters that look remarkably like an eerie cityscape. In the late 17th century, Kircher produced a book on Noah's Ark for the 12-year-old king of Spain, Charles II. In this book, Kircher wrestled with problems that plagued other scholars and mapmakers of his time: how to reconcile religious orthodoxy with reality. According to Genesis, four rivers — Physon (or Pishon or Pison), Geon (or Gihon), Tigris and Euphrates — flowed out of Eden. Although the present-day paths of the Tigris and Euphrates were well known, tracking down the other two proved a tad problematic. 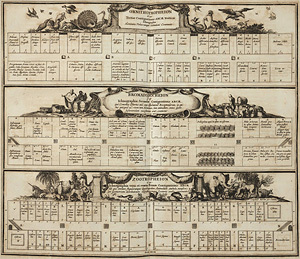 Kircher also tried to square the biblical river routes with his conviction that all rivers originated in mountains. The origin of at least one river in this sumptuous illustration was conveniently concealed behind the text panel in the upper right. 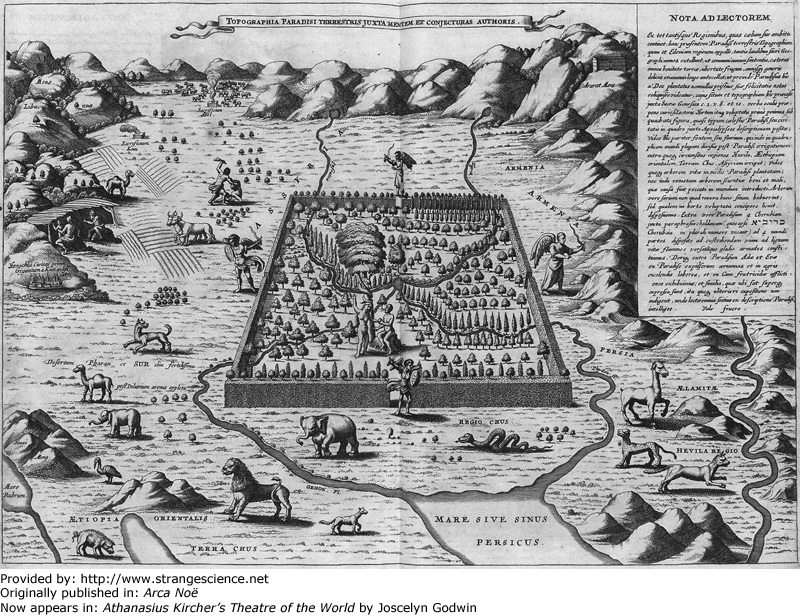 In between the rivers, Kircher's map showed snippets of Genesis stories, including the murder of Abel and a troublemaking snake. Adam and Eve lived inside an enclosed, rectangular, orderly garden. In the book he wrote specifically for Charles II, Spain's new tween king, Kircher overlooked few details. He provided precise floorplans for Noah's vessel, explaining that people and birds lived on the top level, other terrestrial animals lived on the bottom level, and supplies occupied the level in between. One foldout diagram appeared to show workers hauling in food, or perhaps hauling away animal waste. By the time Kircher assembled this book, discoveries from the Americas presented naturalists with fresh challenges. Accommodating all the animals from the Old World on a seaworthy vessel was hard enough; animals from the New World threatened to plunge the Ark to the bottom of the sea. Kircher found a way around this logistical problem by proposing that many modern animals were really hybrids, the armadillo among others. Note that while giraffes and leopards could rely on hybridization for their ancestry, the unicorn (lower left) enjoyed passage on the ship. So did some troublemaking snakes. 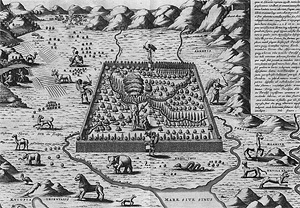 In the book he wrote for Spain's preadolescent king Charles II, Kircher examined logistical problems of the flood and Noah's Ark, problems such as how the Earth could have created and disposed of enough water to reach the highest mountaintops, and how Noah and his family dealt with the mountains of manure produced by their passenger pairs. Just as Kircher endeavored to explain certain aspects of the flood, he also used the flood to explain other things, such as the disappearance of a fabled landmass. In this map, the mottled areas indicate lands that remained permanently submerged after the biblical floodwaters retreated. Atlantis appears west of the Iberian Peninsula. 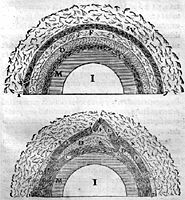 The top image, shows Kircher's hypothesis that wind forces ocean water into underground reservoirs, from which it emerges through springs, rivers and lakes. Convinced that mountains gave rise to rivers, Kircher looked for the seminal mountains on each continent. The bottom image shows the Earth's fiery core (which is also shown in the top image) feeding smaller fires that eventually emerge as volcanoes. 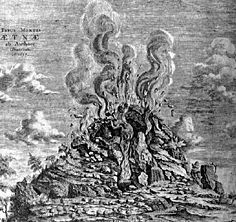 Though a little fanciful, this illustration of Mount Etna was far less speculative than Kircher's pictures on the Earth's core. 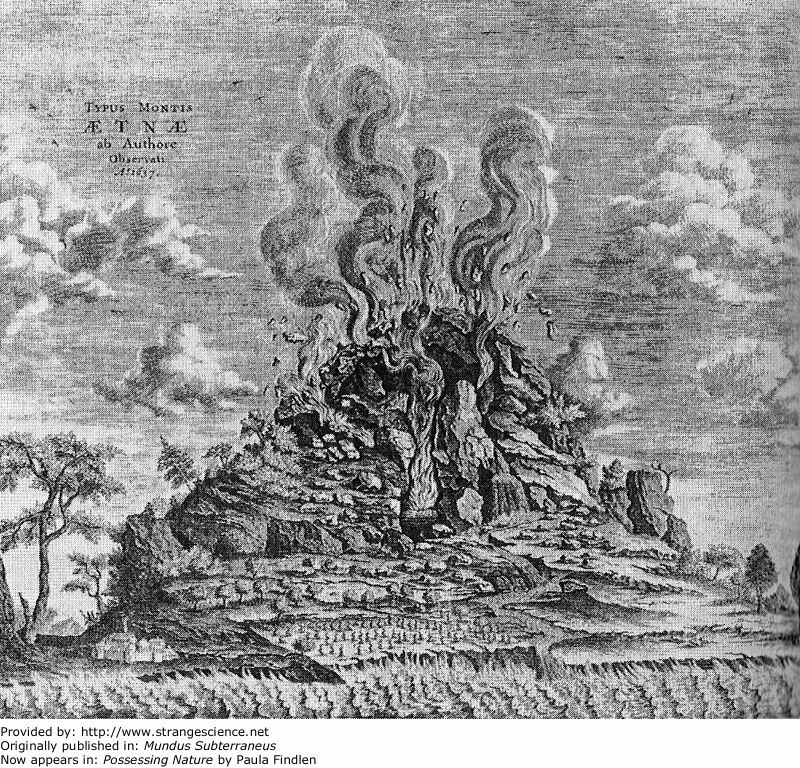 It was based on his own visit to the smoking volcano in 1637. The Jesuit visited Vesuvius, too, and wrote, "When I finally reached the crater, it was terrible to behold. The whole area was lit up by fires, and the glowing sulphur and bitumen produced an intolerable vapor. It was just like hell, only lacking the demons to complete the picture." 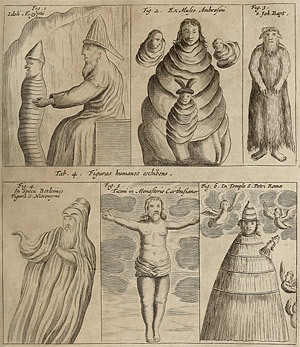 Athanasius Kircher's Mundus Subterraneus covered subjects related to Earth sciences when the processes of fossilization and crystallization were poorly understood. Kircher believed in a continual creative force in the universe, and to his mind, this creative force could devise objects with uncanny resemblances to living things. That might have been his explanation for this "toad stone." Mined from Jurassic limestone, Verona Stone was often used for ornamental purposes, and Ulisse Aldrovandi described it in his Musaeum Metallicum. 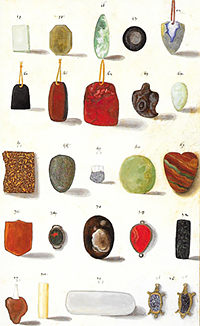 Aldrovandi described the stone as a natural curiosity that imitated snakes. In fact, the odd shapes were probably caused by the activity of cephalopods, whose shells have been found in the same rock layer in abundance. The mollusks likely disturbed the sea floor, creating sinuous shapes. Although he misinterpreted Verona Stone, Aldrovandi did describe other trace fossils, such as bore holes, accurately. In the late 15th century, meteorites were sometimes called thunderstones. More importantly, they were often taken as omens, sometimes mighty convenient ones. When a meteorite fell on the town of Ensisheim, Sebastien Brandt, a law professor at the University of Basel, interpreted the event as a message from God, namely that Maximilian of Austria should invade France. Whether or not it was the open letter that convinced him, Maximilian invaded. The fighting turned out well for Maximilian and he gained three provinces. Troops in tow, he visited Ensisheim and inspected the meteorite, suggesting the locals hang it in a local church. There the meteorite remained for centuries. This is not a goof. It's just to pretty to ignore. In the 1820s, London's Geological Society was on the hunt for recognition, including a Royal Charter of Incorporation, and rent-free digs for its meetings and collections. An early president of the society, William Buckland, secured those prizes, but something else eluded him. He wanted the society to have its own coat of arms, and the process was pretty formal, including "applying to the College of Heralds for a Grant of Arms," according to historian Boylan. Though Buckland failed to secure an official seal, he and fellow geologist Henry De la Beche tossed around ideas, including this charming sketch. (Buckland made his own coat-of-arms sketch, but it couldn't compare to De la Beche's.) An ichthyosaur and plesiosaur act as playful "heraldic supporters" for a shield, which itself bears a cross-section of a fossil-rich cave in the upper left, an ammonite trio in the upper right, and an idealized geological section of part of the Alps across the bottom. Above the shield is the traditional weapon-wielding arm, but instead of the customary knife, this one wields a geological hammer. The Geological Society did settle on a logo decades later. It was polished and professional, but far less interesting. The University of Cambridge opened its Sedgwick Memorial Museum (in honor of geologist Adam Sedgwick) shortly after the turn of the 20th century. Continuing the tradition of fossil species flanking a coat of arms, this museum entrance featured a relief decorated with the floral motifs common in the Art Nouveau period. 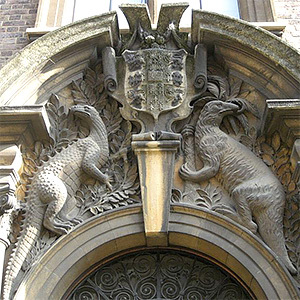 On either side of the coat of arms was a fleshed-out fossil, an Iguanodon on the left, and a Megatherium on the right. The arrangement might give the casual visitor the impression that these species lived around the same time, but the museum staff knew better, and the contents of the museum's cabinets would educate any visitor who paid attention that a vast timespan separated the two. Still, the Megatherium bears an unusually narrow, gracile skull, and the Iguanodon, though much improved over earlier reconstructions, still sports a dragon-like line of spikes down its back. Even so, this relief is impossible to dislike. Likely taking inspiration from the apocalyptic art of John Martin, this scene shows the same kind of angry-reptile roaring contest. Marine reptiles, one with a forked tongue, the other with webbed feet, face off as an Iguanodon watches and pterosaurs swoop overhead. Pannemaker apparently believed that prehistoric reptiles occupied a hellscape. Not only does a volcano belch in the background; a but plume of fire also swirls up from the water surface. "Compliments of the season," read greeting cards from De La Rue Printing Company, some of those cards featuring prehistoric life. 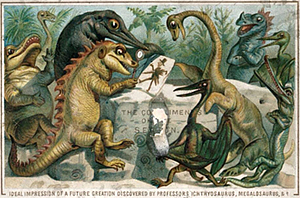 In this picture, an assortment of Mesozoic reptiles cheerfully scrutinizes a picture of a Victorian gentleman. The caption reads, "Ideal impression of a future creation discovered by Professors Ichthyosaurs, Megalosaurus, etc." What is going on? It's possible this greeting card takes its inspiration from a cartoon drawn by the gentleman geologist Henry De la Beche, a cartoon targeting another gentleman geologist, Charles Lyell. Lyell's Principles of Geology remains one of the most important books in the history of geology, and yet a couple of his speculations were a little nuts. In arguing for cyclical changes in Earth's climate, he also argued that some long-extinct animals might reappear, including dinosaurs, pterosaurs and ichthyosaurs. De la Beche made mincemeat of Lyell's idea, drawing a cartoon entitled Awful Changes . That cartoon featured an assemblage of future reptiles — all resembling fossil finds from the Mesozoic, all of them listening to a lecture from an ichthyosaur about the fossil find of an "ancient" human skull. In that cartoon caption, De la Beche quipped, "You will at once perceive," continued Professor Ichthyosaurus, "that the skull before us belonged to some of the lower order of animals, the teeth are very insignificant the power of the jaws trifling, and altogether it seems wonderful how the creature could have procured food." Ireland is not known for many dinosaur fossils (alas) but for many years, the Emerald Isle was known for the oldest amphibian fossils on record. Found in 1864, an assemblage of plant and animal fossils from the Jarrow Coal Mine in County Kilkenny included 320-million-year-old amphibian fossils. 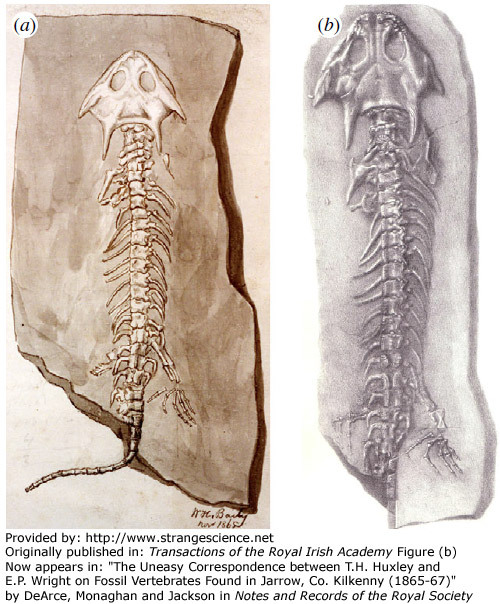 William Brownrigg first reported on the fossils to the Royal Geological Society of Ireland (RGSI). He initially stated fossils belonged to "six, if not seven, perfectly new genera of reptile," when in fact, they were amphibians, but that view was soon amended. The real blunders in this story came afterwards, and had little to do with confusing amphibians and reptiles. Edward Wright, a member of the RGSI who had encouraged Brownrigg to collect the fossils, decided to bring in an international expert on amphibians: T.H. Huxley. Huxley, perhaps not entirely aware of the research that had already been done, was happy to help. He soon wrote to Charles Lyell, "I returned last night from a hasty journey to Ireland, whither I betook myself on Thursday night, being attracted vulture-wise by the scent of a quantity of carboniferous corpses." Huxley and Wright divvied up the science-paper-writing duties; Huxley would formally describe the fossils while Wright would pen the introduction. But DeArce, Monaghan and Jackson report, "A comparison between Brownrigg's initial presentation and Wright's introductory paper shows that the latter had just copied the former." Wright then gave his only copy of his part of the paper to a journalist who, as Wright and Huxley's publication deadline approached, wasn't returning it. Meanwhile, William Baily, acting paleontologist in the Geological Survey of Ireland, sent a letter to Geological Magazine saying credit for the fossil discovery belonged to Wright and Brownrigg (not Huxley) and furthermore, he (Baily) had examined the fossils before Huxley had. Baily followed up that claim by presenting his watercolor of one of the specimens, dated November 1865, at the RGSI meeting on December 13, 1865. In the end, the scientist associated with the named species was Huxley. 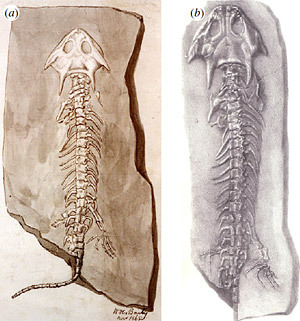 Baily eventually received a small grant from the British Association for the Advancement of Science to examine other fossils. When their paper was finally published, Huxley and Wright were at least gracious enough to mention Brownrigg multiple times, but in 1868, he resigned from the RGSI, and he sold his Jarrow fossil collection to the British Museum a few years later. As for the Jarrow amphibians, 20th-century finds eventually knocked them from their oldest-amphibians pedestal, but they enjoyed that status for more than a century. Despite hundreds of millions of years of evolution, terrestrial vertebrates have never matched the diversity of fish, and the number of vertebrate species living today is only a tiny fraction of the species that have existed in the last half a billion years. In the 19th century, Louis Agassiz likely contributed more than any other single person to our knowledge of fossil fish. 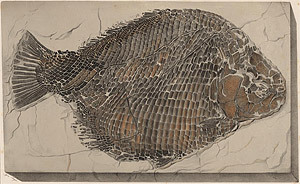 In collaboration with artists such as Joseph Dinkel and August Goldfuss, Agassiz published exquisite, accurate illustrations of fossil fish. He published his monograph of fossil fish species over the span of a decade, and increased more than tenfold all the formally described vertebrates known to science. Moreover, his work is still valuable today in reconstructing the evolutionary history of fish. Yet this prolific describer of fossils never accepted Darwinian evolution; late in his life, he made opposition to evolution perhaps his highest priority. So when ardent evolutionist Ernst Haeckel characterized Recherches sur les Poissons Fossiles as "one of the strongest proofs of the truth of the theory of evolution," Agassiz was nearly apoplectic. When it came to understanding the history of life on Earth, medieval and Renaissance Christians didn't necessarily take the Bible literally. That practice may have begun as late as the 17th century. Once biblical literalism started, however, it quickly gained adherents. English physician John Woodward published An Essay on the Natural History of the Earth in 1695, and soon impressed the Swiss naturalist Scheuchzer. Within 20 years, Scheuchzer published a pamphlet, Piscium Querelae et Vindiciae (translated as Complaints of the Fishes ). Somewhat playful, and beautifully illustrated, the pamphlet aimed to rebuke all other explanations for the existence of fossils outside of the Noachian flood. 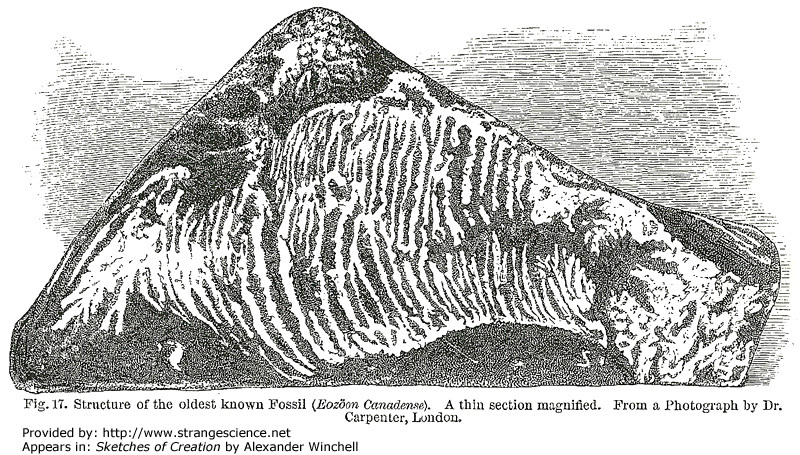 So while this illustration of the fossil may be accurate, Scheuchzer's explanation for its existence is not. Although many artists and scientists made mistakes, now preserved for posterity, plenty of other practitioners touched upon accurate ideas ahead of their time. 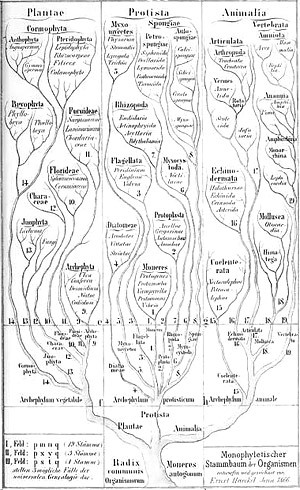 Traditional wisdom maintains that the concept of evolution wasn't depicted prior to Lamarck's tree diagrams at the turn of the 19th century. But in the late 18th century, a Carmelite monk named Francesco Maria Soldini penned a book examining whether animals have souls. The Florentine publishers apparently decided to decorate the book with engravings bearing little relation to the text. 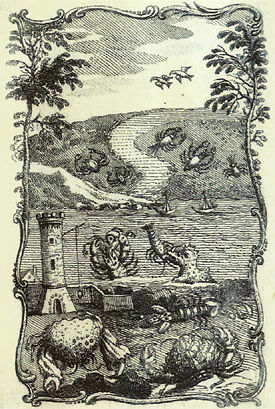 The artists behind the engravings remain unknown, but this image apparently pictures animals moving from the sea to land. Perhaps inspired by the Neptunian notions popular at the time, the pictures could show early depictions of biological evolution, decades before Charles Darwin posed a workable theory. Born at the dawn of the 19th century, Anna Maria Redfield earned the equivalent of a master's degree from the first U.S. institution of higher learning devoted to female students: Ingham University, and became perhaps the first woman to design a tree-like diagram of animal life. 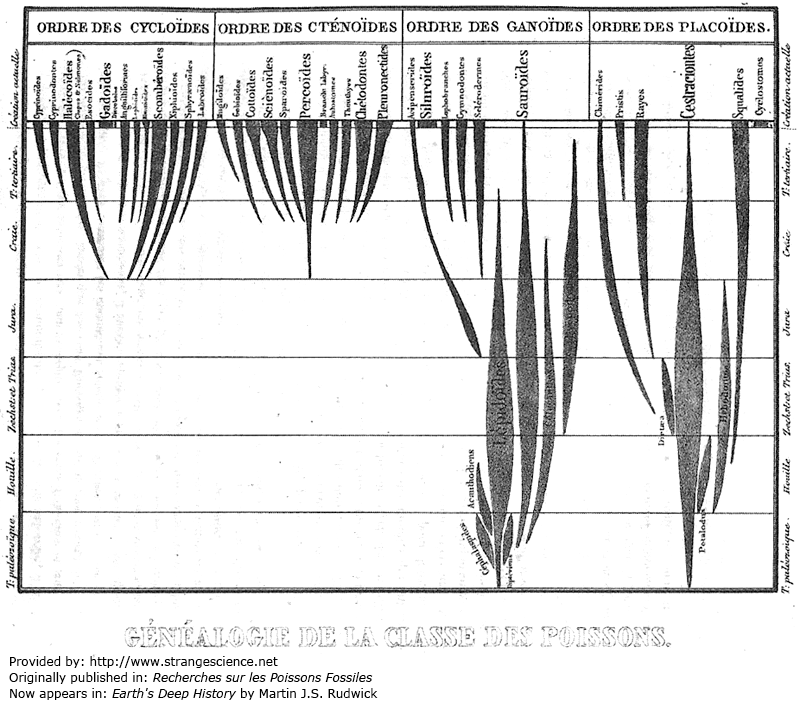 Although tree-like, her diagram didn't show common ancestry but instead showed the "embranchements" established by Georges Cuvier: vertebrates, arthropods, mollusks, and "radiata" (today classified as cnidarian and echinoderm phyla). 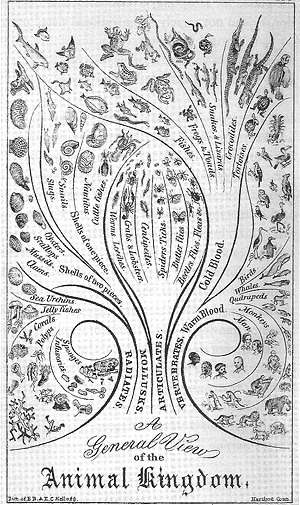 To be fair, this diagram was published before Darwin's Origin of Species but later editions of her work made no mention of evolution either. Instead, she wrote about our simian cousins, "The teeth, bones and muscles of the monkey decisively forbid the conclusion that he could by any ordinary natural process, ever be expanded into a Man." Still, her elegant work is great fun to behold even now. Through illustration and sculpture, Benjamin Waterhouse Hawkins brought extinct organisms to life in the mid- to late 19th century. He worked with both Charles Darwin and Richard Owen, but Owen apparently had a greater impact on Hawkins's beliefs. Despite having received letters of recommendation from Darwin, Hawkins not only rejected evolution, he delivered a series of lectures criticizing Darwin for supporting it. 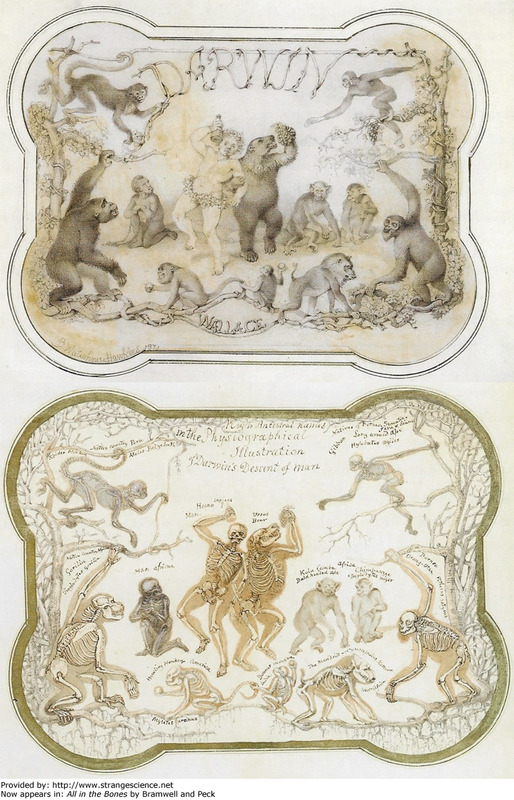 Bramwell and Peck suggest that Hawkins might have used these watercolors — one showing fleshed animals, the other showing their skeletons — in a lantern slide for one of his popular lectures. Surrounded by a small audience of primates, a drunken human dances with a drunken bear. The implication is that one would have to be drunk to accept any relationship between humans and "lower" life forms. Yet in advancing the argument for evolution, Darwin noted the kinds of similarities in tetrapod limb structure that Hawkins's anatomical training should have allowed him to see. Instead, Hawkins insisted that the overall pattern of life on Earth, including humanity's superiority, had been "created and fixed by the Almighty Architect in the beginning." It's unlikely Hawkins thought that his conviction about an almighty architect could be tested and disproven. But science, unlike religion, is all about testing hypotheses. Darwin's theory of natural selection, after more than a century and a half of testing and study, is yet to be rejected by the science community. 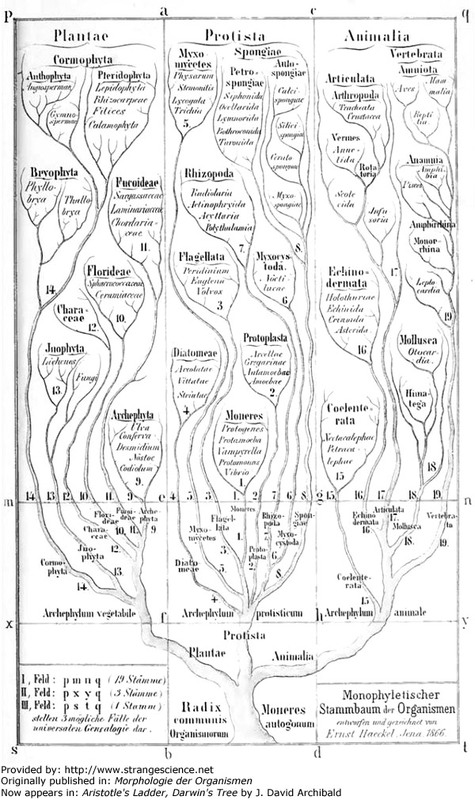 Probably no 19th-century scientist was more prolific in publishing evolutionary trees than Haeckel. Archibald points out that Haeckel tackled a problem that lingers today: "How did life begin and how many times did it do so?" 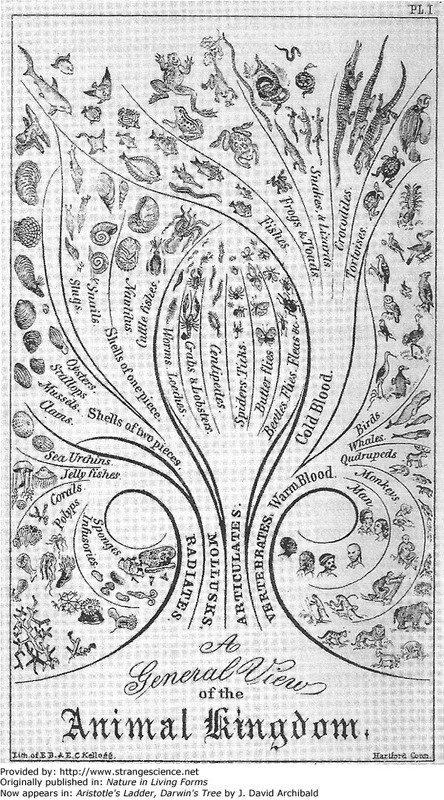 In this tree, Haeckel illustrated three possibilities: all life arising from a single moneran (single-celled, bacteria-like organism); different monerans evolving into plants, animals and other monerans; and many original monerans forming the basis of all life. But there's something interesting about this tree, namely the visual prominence given to vertebrates and the lack of prominence afforded arthropods. (The Arthropoda branch appears under Articulata slightly below Vertebrata.) The visual arrangement isn't necessarily a mistake, but in terms of species diversity, it's misleading. Arthropods comprise roughly 85 percent of animal species so far identified while vertebrates account for a paltry 5 percent. That's not something you'd surmise from Haeckel's tree. When faced with the question of whether the chicken or the egg came first, Philip Henry Gosse answered that creation "solves the dimemma. . . . But what is creation? It is the sudden bursting into a circle." In other words, all of God's handiwork was, in Gosse's view, cyclical, and the divine act of creation made the whole cycle at once. This life cycle of a cow was one of several examples of cycles Gosse offered in his book, which was not a bestseller even among biblical literalists. Although the book might be viewed as a refutation of Darwinian evolution, Omphalos was really intended to refute the mid-19th century's growing consensus about an unimaginably long geologic timescale. Early on, Gosse's book states, "If any choose to maintain, as many do, that species were gradually brought to their present maturity from humbler forms, — whether by the force of appetency in individuals, or by progressive development in generations — he is welcome to his hypothesis, but I have nothing to do with it. These pages will not touch him." In fact, Gosse's book preceded the first public announcement of Darwin and Wallace's discovery of natural selection. In the late 1850s, a local collector brought some rock samples to William Logan, head of the Geological Survey of Canada. In 1864, Logan showed the specimens to Dawson, who concluded that they were fossils of foraminifera. Unlike modern foraminifera, which are tiny, multi-chambered shells, these forams were huge. Perhaps, their extreme size resulted from their extreme age; these fossils came from rocks estimated to be over a billion years old. Dawson dubbed them Eozoön Canadense, or "dawn animal of Canada." Eozoön enjoyed the status of oldest known organism for years, and Winchell highlighted it in his book about the history of life. There was just one problem. In 1894, J.W. Gregory and Hugh Johnston-Lavis found eerily similar samples of big, old foraminifera in limestone blocks spat out quite recently by Mount Vesuvius. Magma intruding into layers of limestone can deform the limestone and create convincing pseudofossils. Did you know rocks could have babies? Well maybe not, but that's just what a lot of people used to think. When some rocks were broken, they revealed smaller rocks inside, and some rocks were even rumored to spontaneously burst open, giving birth to little rocks. Where did people get these ideas? From rocks that are now called concretions. When layers of sediment cover an object and immediately harden, they form a tough nodule. (This often happens to fossils, and preserves them very well.) Sometimes, the inner layers of sediment in a concretion erode away, leaving the small core rattling around inside a tough outer layer. When the outer layer is broken open, it looks like the rock had a baby. 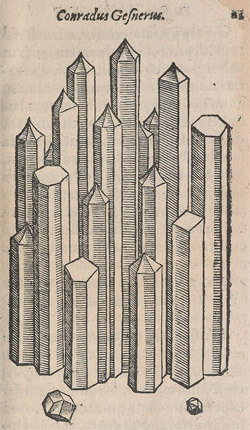 For a picture in a book about fossils, this looks an awful lot like a bunch of crystals, probably because Gesner's fossil book really did include crystals. This wasn't a mistake on Gesner's part so much as a difference in language. An old saying in academic circles is, "Language affects perception," and a good example of that is how differently the term "fossil" has been defined. Today, a fossil is defined as any evidence of ancient life, but in Gesner's time, a fossil was anything dug out of the ground, and that could include a crystal. Just as it might seem odd that a book about fossils would show crystals, it's equally weird that the same book would include a picture of unmistakable bling, but that's what Gesner's fossil book does. The top ring bears a shiny diamond; the bottom ring bears a stone engraved with a scarab beetle. The scarab beetle alludes to hieroglyphs, and in Gesner's day, hieroglyphs alluded to Hermes Trismegistus, a mystical figure some Renaissance scholars believed to be a contemporary of Moses, maybe even Moses himself. Hermetic documents might deliver to sagacious minds divine knowledge uncorrupted by centuries of mistranslation, or so some scholars hoped. The mystic hints in this image don't stop with the beetle. Surrounding the rings, and numbered for clarity, are 12 gemstones. They're not just any 12 gemstones. Gesner chose to illustrate and write about the same gems commonly believed to adorn the breastplates of the Jewish High Priests and symbolize the 12 tribes of Israel. The stones also corresponded to signs of the zodiac. 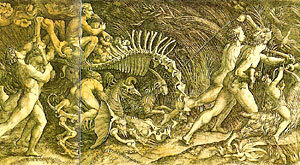 How much Gesner believed in this mythology isn't clear, but he did choose this image for his fossil book's title page. Today a fossil is identified as any evidence of ancient life. Centuries ago, fossils were identified as anything dug up from the ground, and savants frequently lumped items of organic and inorganic origins together. Here, Bauhin depicted a snail shell and a crystal together because they had the same general shape. Savants often looked for objects resembling body parts, hoping those "fossils" could cure the ailing organs. 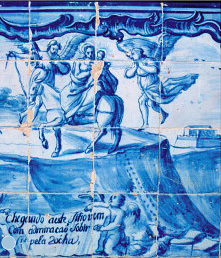 These painted ceramic tiles date from the 18th century, but the scene illustrates a legend centuries older. Sauropod tracks and fossil burrows adorn Portugal's Cape Espichel, but when sailors first spotted the tracks in the 13th century, nobody knew about ancient burrowers or dinosaurs. In Europe's religion-infused Middle Ages, locals came up with a suitably inspiring interpretation: The tracks belonged to a giant mule that carried the Virgin Mary. Good Catholics even erected a shrine to Nossa Senhora da Pedra Mua ("Our Lady of the Mule Stone"). 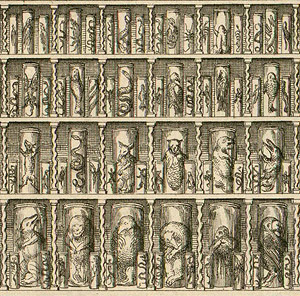 The medicine cabinets of Europe's upper crust often included glossopetrae, or serpent tongues. Until they were properly identified as fossil shark teeth, the objects were not just believed to be serpent tongues turned to stone, they were also prized for their alleged curative powers. 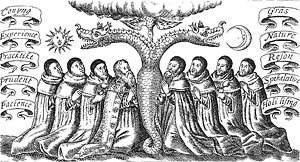 Glossopetrae could speed childbirth, protect against snakebite, warn their owners of the proximity of poison by sweating in its presence, cure sore mouths, and even guard against diseases caused by witchcraft. In this illustration, the tooth in the upper left corner, with its two-pronged root, especially resembles a forked snake tongue. As they sing on Sesame Street , one of these is not like the others. Although these items all have the same general shape, one of them clearly doesn't belong. In the early days of geology, many mistakes involved the misinterpretation of organic remains, but when nearly anything pulled out of the ground was called a fossil, and when naturalists based their interpretations largely on overall shape, they sometimes mingled fossils and human artifacts. 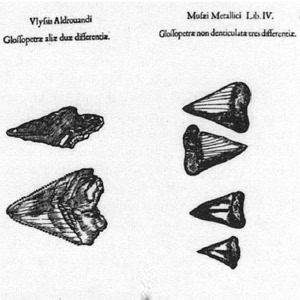 In this picture, Aldrovandi mixed an arrowhead with shark teeth. Ceraunia ("thunderstones" now understood to be artifacts) were thought to form inside clouds, and fall to the Earth when lightning struck. Glossopetrae ("tongue stones" now understood to be shark teeth) were sometimes rumored to fall from the sky during eclipses of the moon. 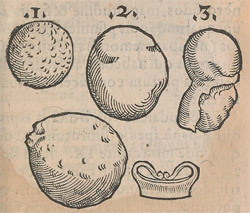 As Conrad Gesner observed, some of his contemporaries confused thunderstones and tongue stones. 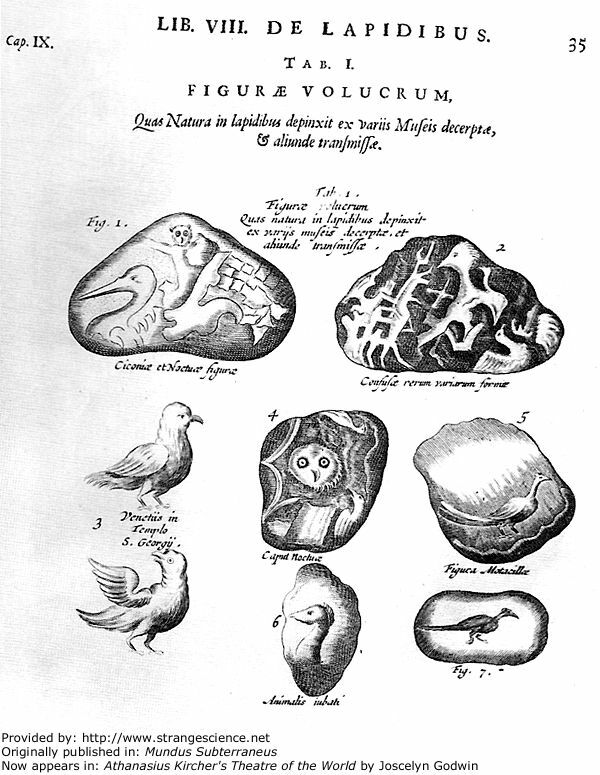 In the course of the 17th century, naturalists figured out the origin of tongue stones. You might think that a flint arrowhead would be easier to figure out, but these Stone Age artifacts posed their own puzzle: Who would make an arrowhead out of rock when metal was far superior? After all, didn't the Bible say that God had imparted knowledge of metallurgy to Cain's descendant Tubal-Cain? In 1609, Boethius de Boodt proposed that ceraunia were metal tools that had turned to stone. Before that, Michele Mercati penned Metallotheca arguing that they were really stone artifacts. Mercati got around the metallurgy difficulty by suggesting that knowledge of metallurgy was temporarily lost in the aftermath of Noah's flood. His interpretation was closest to the truth regarding the artifacts' composition, if not their age, but his manuscript wasn't published until a century after his death in 1593. Modern science historians Glyn Daniel, Alain Schnapp and Matthew Goodrum have argued that encounters with New World peoples, and collection of their stone tools, helped savants like Mercati clear up the mystery surrounding Stone Age tools found in Europe. What 18th-century scholars regarded as "figured stones" are today recognized as fossils. The circular and star-shaped objects at the top appear to come from crinoid (sea lily) stems. The figure near the bottom of the frame is probably a trilobite fossil. 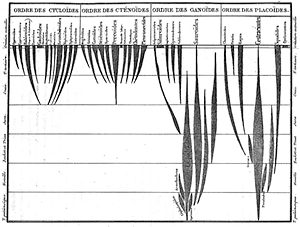 In another example of the confusion over the organic versus inorganic origin of fossils, Bauhin drew what looked like stalactites dangling from the ceiling of a cave. In fact, these fossils belonged to belemnites — shells of squidlike animals. Even in the age of Pliny, savants recognized that some stones could attract iron, and further that some of these stones were bipolar, attracting iron on one side and repelling it on the other. Still, the power of these magnets (or lodestones, as they were called) was a tad overrated. Legends told of lodestone hills along the Indian coast so powerful that no ship held together by iron nails dared sail past. This picture shows the resulting tragedy as the nails fly to the hills and the passengers sink into the water. A commonly held belief during the Middle Ages and Renaissance was that lead could be turned to gold, as in this wishful depiction. Anti-alchemy laws forbidding transmutation of lesser metals into gold were not uncommon — not because the lawmakers thought transmutation would fail, but precisely because they thought it might succeed and undermine the economy. In his plan for the ideal alchemical factory, 17th-century polymath Johann Joachim Becher neatly divided up the tasks that different workers would do. Becher insisted that the laborers be illiterate, or at least denied access to pens and paper, and that laborers from different parts of the factory be forbidden to fraternize with each other and trade secrets. (In fact, 20th-century science does enable us to change lead to gold, but the energy requirements are so costly, it's easier to find gold the old-fashioned way.) Regardless of how alchemical gold might have changed commerce, debates raged about its usefulness in medicine; centuries ago, some people actually ingested gold in hopes of strengthening their hearts, but no one knew whether "alchemical" gold could have the same effect. Chemistry has a forerunner that is centuries older, less accurate and much less straightforward. The mysterious set of practices known as alchemy might all owe their origins, at least in part, to ancient writings attributed to Hermes Trismegistus. The writings in question probably date from the first two centuries AD, but Renaissance believers thought Hermes might be a contemporary of Moses (if not the great prophet himself) and the deliverer of divine knowledge to mankind. One of Hermes's great gifts was alchemy, the ability to transmute base metals into precious metals, but more importantly to attain spiritual insights embodied in the Philosopher's Stone. Medieval and Renaissance alchemists were expected to be two things at once: charitable and envious. They were to be charitable in sharing their knowledge with others for the betterment of the whole world. But they were also to be envious by safeguarding their esoteric wisdom from the vulgar masses who would misunderstand and possibly abuse it. 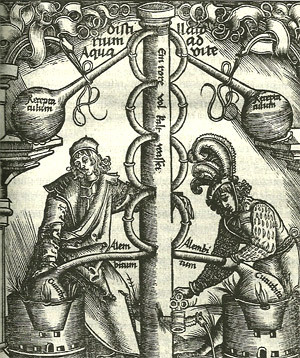 As a result, alchemy books often communicated through the kind of symbolism that would be known as dog whistling today. The symbols included real and imaginary animals, monsters and heroes. 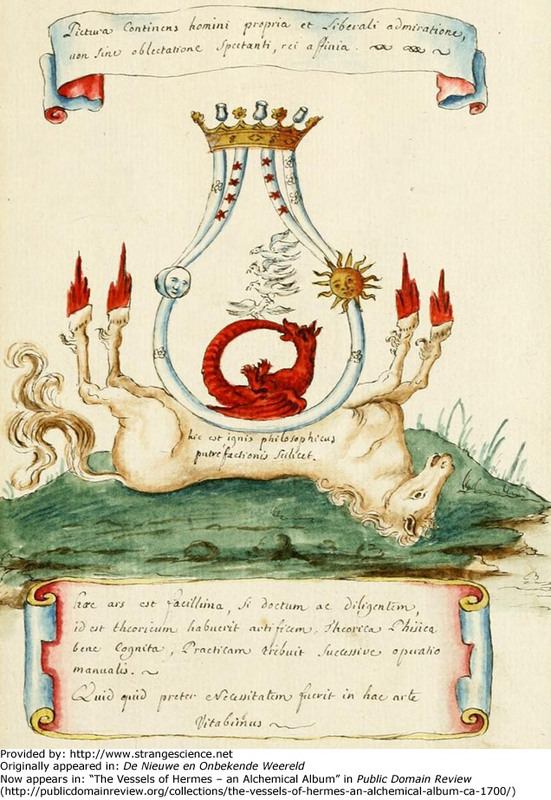 This illustration, published in the 17th century, has been described as the bird of Hermes giving the alchemical dragon the celestial flux. And you thought your chemistry textbook was hard to decipher. 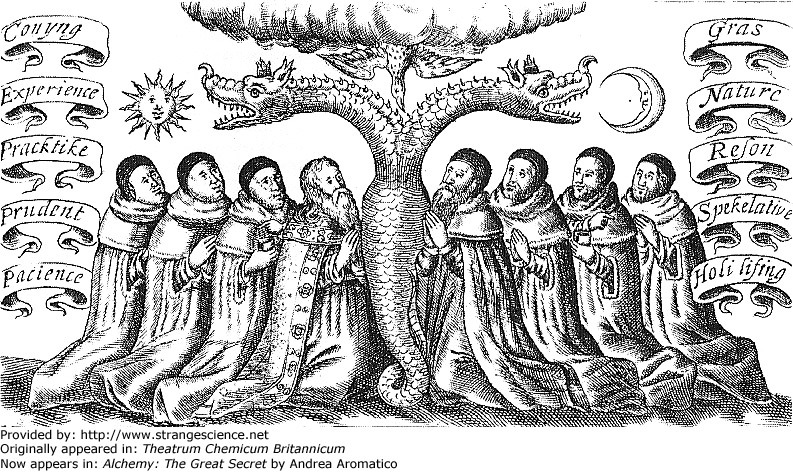 Precursors of chemists lived in a world riddled with secrecy, symbolism and celestial correspondences. For instance, during the Middle Ages and Renaissance, copper wasn't just copper, it was the Earthly material like the planet Venus. And gold corresponded to the sun, silver to the moon, Jupiter to tin, and Saturn to lead. Mercury was the name of both the planet and the shimmering liquid we now know is toxic. As silly as the mystical associations seem today, many alchemists did make discoveries about the metals they studied for spiritual enlightenment. They also built lab equipment. These images show a few alchemical vessels, a couple of them with their corresponding symbols. The savant writing about them, Della Porta, would have known about the expected stages of transmutation from pedestrian to spiritual metal in an alchemist's lab: black (Nigredo), white (Albedo), yellow (Citrinitas) and finally red (Rubedo). The Latin term Rubedo experienced a new popularity when it was appropriated in the 21st century by Tiffany jewelers for a very pretty pink alloy, but the jeweler apparently also appropriated alchemy's affinity for secrecy regarding the alloy's actual gold content. Manly Palmer Hall was an early-20th-century mystic who published The Secret Teachings of All Ages in the 1920s, and acquired some remarkably weird manuscripts in the 1930s. One gem he purchased, perhaps at a Sotheby's auction, was an alchemical album by an unknown author, composed at the dawn of the 18th century. 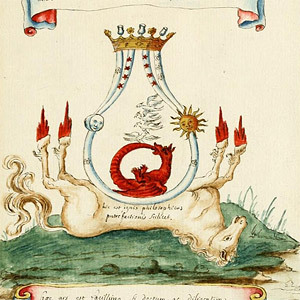 The watercolors in this album included symbolic illustrations hard to interpret today: cherubs representing salt, sulfur and mercury bearing a giant egg, and an androgynous creature created by alchemical processes. This illustration has been described as "the sublimation by the eagles after putrefaction." The sun and moon both smile upon a dragon that eats its own tail while perched on the belly of an upside down horse. A stack of eagles alights on the dragon, and the upturned horse apparently shoots flames from its hooves. Besides such handy tricks as turning base metal into gold, alchemy promised to enable its adherents to find the kind of esoteric wisdom hinted at in this manuscript. Skepticism about alchemy had thrived for centuries — Persian polymath Avicenna (ibn Sina) and Jesuit polymath Athanasius Kircher both doubted alchemical claims — but the ranks of the firm believers included such luminaries as Isaac Newton. Although medieval and Renaissance alchemy often concerned itself with transmuting base metals into gold or achieving philosophical insights, other applications were considered more practical. 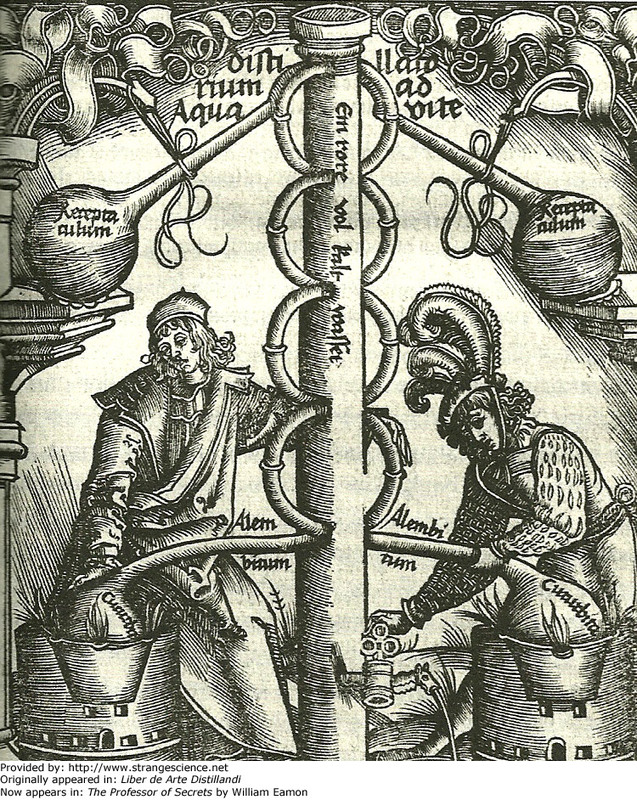 This illustration shows alchemists in the process of distillation, a general process still in use today. These alchemists prepare distilled medicinal water. Though closer to the aims of modern chemistry than other facets of alchemy, some Renaissance distillation aims were a little overly ambitious. Though distillation, alchemists sought, in the words of science historian Bruce Moran, "a super-medicine, an elixir or aqua vitae that could purify physical bodies of their impurities, rid the human body of disease, and prolong life." "From what I have been able to see and observe, the wood is not generated from the seed or root of any plant whatsoever, but only from a type of Earth, containing much clay, which is slowly transformed into wood," Stelluti wrote. Stelluti was wrong, and for members of the meticulous Lincean Academy, such errors were rare. The mistake is forgivable, though, considering the fossil wood in question had no fossil leaves attached, and had been carried far away from its original locality. According to Robert Plot, just about every stone was designed by God for the edification or entertainment of humans, including this rock that looked like a funny face. Plot actually called this figured stone Hippocephaloides, meaning "horse head stone." He described this rock among other stones that looked like human eyes, human ears and human hearts. In between reasonable deductions about rocks and fossils, Plot mingled arguments that God specifically placed stones in the Earth for human admiration and edification. 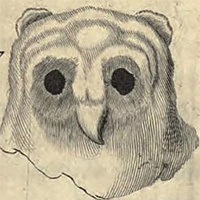 One such admirable stone he dubbed Lapis Bubonius, and noted its apparently resemblance to an owl. One would hope this little owl's head might impart wisdom to the viewer. In assembling what became known as his "paper museum," naturalist Cassiano dal Pozzo collected thousands of illustrations and prints. His collection included some of the best renderings of the natural world available at the time — including animal, vegetable and mineral specimens all depicted with exquisite attention to detail. But while 17th-century naturalists made great progress away from medieval superstition, old ideas lingered. Comprised mostly of jasper, jade and agate, these amulets were still widely believed to have magical or curative powers. Just as humans can form "stones" in our gallbladders or kidneys, so can other animals. That much, medieval and Renaissance Europeans understood, though they seemed to think some stones came from different parts animals' bodies, such as the head of a frog. Here, a man extracts stones, called a bufonites, from the head of a frog who seems pretty good-natured about the whole process. Although you and I probably wouldn't want to handle these stony secretions (often called bezoar stones), they were once highly valued, some selling for 10 times their own weight in gold. Why? They were thought to be an antidote to all kinds of poison. In an age when the ranks of royalty were often dispatched with poison — sometimes by their own family members — antidotes were hot items. Although some animals do produce stony secretions, the stones reputed to come from frog heads were as rare as they were valuable. The text with this frog woodcut extolled the virtues of the toad stone: "Borax is a maner of tode that hathe a stone in his hede, & whan this stone is goten out the whyie that the tode dothe love than hathe the stone in hymselfe a fygure of an iye, but if it be taken out whan the tode is ded than hathe the venym taken awaye that iye and enpayred the stone. This tode whan that is stered or meued than swelleth it of his owne venym or poyson." Advice on procuring toad stones warned that such an object had to be extracted from a living frog by grabbing the rock after the frog somehow ejected it, but before the animal could "sup it up again." To coax the toads to do the desired casting out, the amphibians had to be placed on a piece of red cloth. (As simple as it sounds, requiring red material would have stopped plenty of toad stone seekers in their tracks; dyes that could color cloth a bright, reliable red were rare and expensive before the invention of synthetic dyes in the 19th century.) There was another reason that getting a rock out of a frog head would be pretty tough: The objects frequently identified as toad stones, or bufonites, were really fossil fish teeth, many from a species that lived during the Jurassic Period. Agostino Scilla, an early proponent of the modern definition of fossils — remains of ancient organisms — may have been the first person to correctly identify these objects. This woodcut shows the use of hematite in treating a nosebleed. The iron-rich ore was believed handy in treating the loss of blood from just about any human orifice. Considering iron figures into human blood as well as into hematite, perhaps the idea wasn't entirely misguided. And mere hematite was probably safer than some other wonder drugs of the time. Some concoctions involved bezoar stones — hardened concretions of undigested matter from the guts of various animals. When big, valuable bezoars were unavailable, savvy apothecaries developed pricey substitutes. 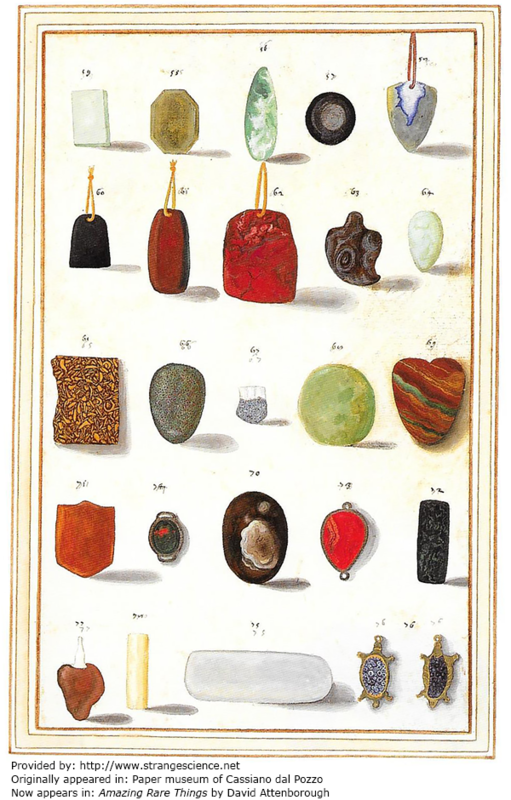 Duffin recounts that one recipe mixed "small bezoars with comminuted precious stones (emerald, topaz, ruby, jacinth and sapphire), other geological materials (fossil shark's teeth, Terra Sigillata, stones from Cananor), semiprecious organic gems (pearl and coral), musk and ambergris, all bound together with hart's horn jelly. The hardened confections were covered with gold or silver leaf and given a high surface polish, emphasizing the high status and expensive nature of the bezoar substitute." For many years, Europeans had been finding weird stones, often pointy, often with holes in them. Today, these stones are understood to be ancient artifacts, namely axes with holes drilled in them for handles. Centuries ago, they were thought to be created by lightning strikes. These thunderstones were carried around or kept in houses to ward off damage from electrical storms. Fossils have a long history of being used as medicine by people who didn't know their medicines were millions of years old. One interpretation of belemnites was that they were Lyncurium or Lapis Lincis — lynx urine turned to stone. The 17th-century naturalist Anselm Boëtius de Boodt argued that belemnites were coveted Lyncurium, in part because when burnt, they stank like cat urine. Naturalists, apothecaries and chronically sick people all coveted these stinky stones because they were believed to cure a long list of ailments. 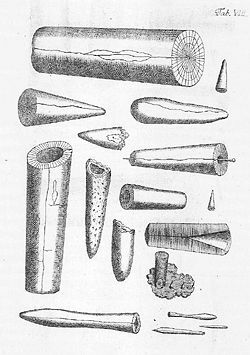 Belemnites are the internal skeletons of extinct cephalopods, and these fossils flummoxed naturalists for centuries. To his credit, Leibniz argued that these strange stones were likely leftovers from once-living animals, though he wasn't sure which ones. He referred to them as "Fingers of Ida." Leibniz had more confidence in identifying fossil shark teeth, having been influenced by the polymath Steno. Although Leibniz scoffed at some contemporary notions about the curative abilities of shark teeth, he did advocate their use in cleaning human teeth. Although best known for his work in astronomy, Kepler also gave serious thought to the composition of the Earth. He explained that the Earth's axis was inclined thanks to magnetic fibers running parallel to it. He also compared the Earth's daily motion to the spinning of a top. What perhaps seems stranger to the modern mind would be Kepler's conviction that the Earth had a soul that both animated geological processes and responded to the positions of other planets. Most people today think of mountains as pretty if not beautiful, but Thomas Burnet argued that they were ugly — remnants of the humanity-punishing biblical flood. People didn't always listen to Burnet as they should have, so he emphasized his point with global maps showing asymmetrical mountain ranges. Before the Deluge, he was sure, the Earth had been a perfect, aesthetically pleasing orb. Many of us have, at some point, known somebody like Robert Broom: a person who is whip-smart, energetic, slightly whacky, and carrying a chip on the shoulder. Born to working-class Scots in the 19th century, Broom ventured to Australia and later South Africa. He clashed with authority figures, breached protocol and championed people he perceived as fellow underdogs. When fellow underdog Raymond Dart came under fire for his characterization of the Taung Child (Australopithecus africanus) as an ancient human ancestor, an interpretation that turns out to be correct, Broom bristled at the "insiders" in the United States and Britain who dismissed the fossil. His reverse snobbery is on full display in this map. 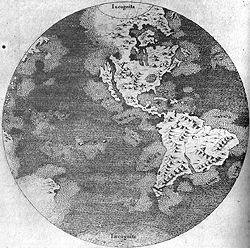 It depicts two massive continents understood by geologists to precede our planet's current landmass configurations: Gondwana in the south and Laurentia in the North. Detecting the earlier continental configurations was no small accomplishment in the years preceding plate tectonic theory. Presumably different land and sea levels could explain the different land configurations to Broom's contemporaries. Though Broom gives Gondwana its proper label and a subtitle of, "The Land of Progress," he simply labels Laurentia, "The Stagnant Northern Continent." Jesse Richmond explains that Broom's nationalist interpretation designated South Africa as the home of human ancestors (other African countries now vie for that title, thanks to newer fossil finds) but didn't stop there. Broom also credited South Africa as the nursery of birds, mammals, flowers, fruits and grains. During Descartes's day, Europeans struggled to understand how the Earth had developed mountains and sea beds. He proposed that, over time, the "outer shell" of an initially soggy Earth had dried out, and the crust had collapsed in places. 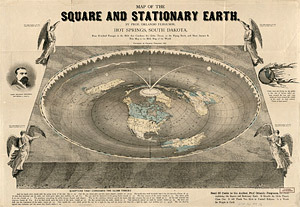 The idea influenced the work of Niels Stensen (Steno), who relied on the phenomenon to explain parts of Earth's geology. Crustal collapse turned out to be wrong, but that didn't keep Steno from laying important foundations of modern geology, and it's not hard to see how crustal collapse would have provided a plausible explanation for many of Earth's features. In producing this image, Nazari wasn't claiming that a creature like this really existed. But this "Philosophers' Mercury" image was intended to symbolize the near-magical metal. The way this three-headed, four-faced animal bit its own tail alluded to quicksilver's dual nature, both solid and volatile. Charles Darwin's last book was The Formation of Vegetable Mould through the Action of Worms . The book discussed the action of annelid worms on Earth's surface, including their beneficial effects on soil. At a time when many people thought earthworms were just pests, he explained the role they played in the formation of humus, or what his contemporaries called vegetable mould. Darwin relayed the surprising and not necessarily welcome news that "all the vegetable mould over the whole country has passed many times through, and will again pass many times through, the intestinal canals of worms." He was surprised at his book's popularity. Punch , meanwhile, saw an opportunity. In December 1881, shortly after the initial release of Vegetable Mould , the magazine published this cartoon in its almanac for the coming year. 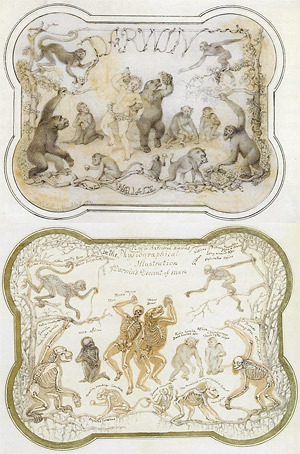 Captioned, "Man is but a worm," it shows CHAOS (lower left) transmogrifying into earthworms, followed by a series of worm-simian hybrids, nearing completion with a Victorian dandy, and ending in Darwin posed like Michelangelo's Adam on the Sistine Chapel ceiling. Considering annelids can't evolve into chordates, this is hardly an accurate diagram of evolution, but scientific accuracy was hardly the aim. Punch wasn't trying to depict actual evolution; the publication was aiming for snark, and probably a little outrage, too. So, no, Punch didn't make a mistake here at all. "There is no authentic history of the world from the Creation to the Deluge, besides that which is found in the first chapters of Genesis," explains James Montgomery in the preface to his book The World before the Flood, a poem . But for the artist who painted this image, the period before the Noachian flood apparently included cave people. This lively scene is a fore-edge, meaning it's painted on the edge of the book opposite the spine. Some fore-edge images were painted on pages fanned at an angle, so when the book was completely closed, the image would be hidden. The book bearing this image is a fifth-edition copy of Montgomery's poem, published in 1819, but that doesn't mean the image was painted the same year. By the early 19th century, gentlemen geologists were uncovering more evidence of an ancient Earth that preceded humans by unimaginably long timespans. Historians were also slowly coming to the realization that prehistoric people shared the landscape with prehistoric beasts. But 19th-century roles applied to prehistory, with women and children waiting in the safety of the cave while manly men took down the interlopers. 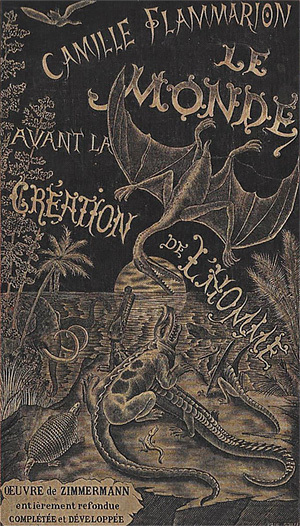 This cover of Flammarion's popular science book reproduces some common 19th-century mistakes in the depiction of ancient animal life: lizard-like dinosaurs, including a low-bellied Iguanodon with a horn on its snout. By the time Flammarion's book was published, that error had been corrected in other works, thanks to more complete fossil finds. That said, Flammarion wasn't the only one to keep perpetuating the wrong image. Also crowded into this shorefront scene are mammals that didn't coexist with dinosaurs: an apparent armadillo and a mastodon or mammoth. All the animals, landlubbers and marine reptiles alike, surround the moon, clarifying that this scene occurs at night. Perpetual prehistoric darkness was another theme in popular science books of the time. 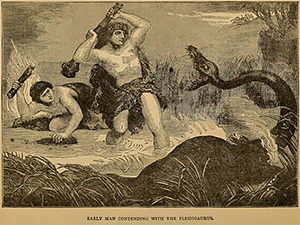 The caption for this image reads, "Early man contending with the plesiosaurus." 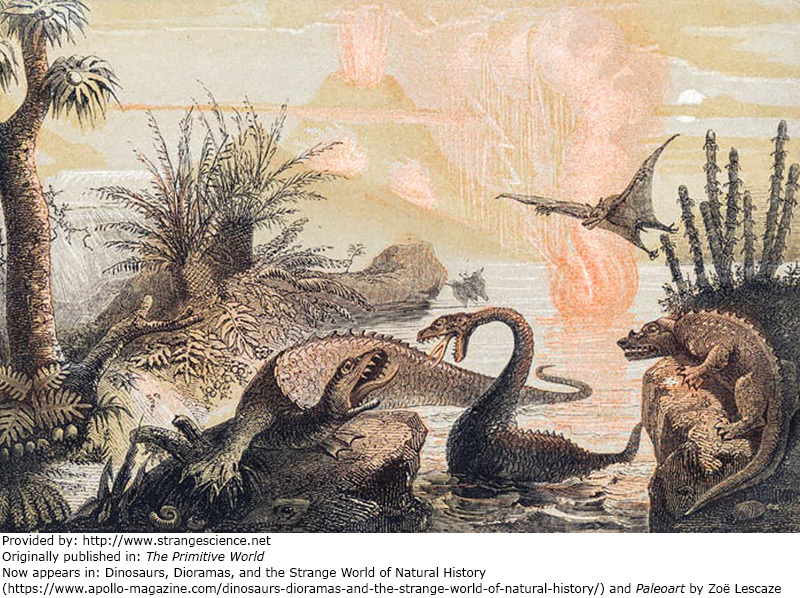 The early men look a bit like Greek gods, and the plesiosaur looks a lot like a dragon with its too-curvy neck, but the larger issue one might take with this picture is that living people and a living plesiosaur appear in it. Decades before Buel published his book, geologists and paleontologists deduced that Mesozoic reptiles and humans missed each other by some 65 million years. But this battle scene does make for good drama. 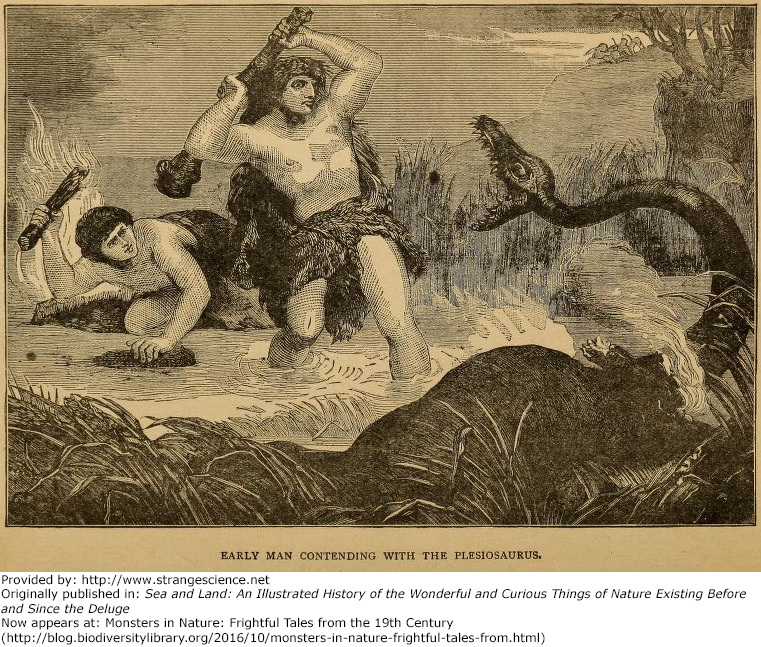 Buel's pseudoscientific Story of Man features pictures to match his prose. 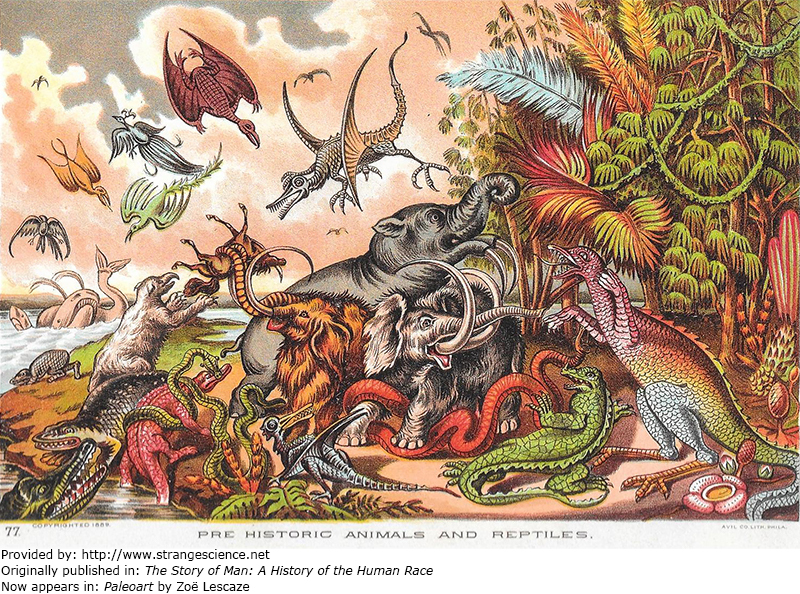 Exuberantly colorful, and just plain exuberant, this image is captioned simply, "Pre historic animals and reptiles." 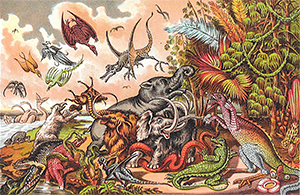 Cenozoic pachyderms jostle with Mesozoic reptiles while flying reptiles and modern birds flap overhead. What might be a peacock appears next to a scaly pterosaur. 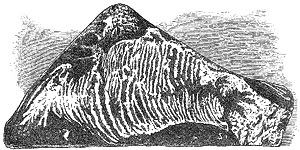 The upside-down equid impaled on the mastodon tusk is probably derived from an illustration by Benjamin Waterhouse Hawkins. 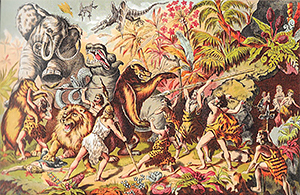 Another scene from Buel's Story of Man is captioned, "Cave-dwellers contending with prehistoric monsters." 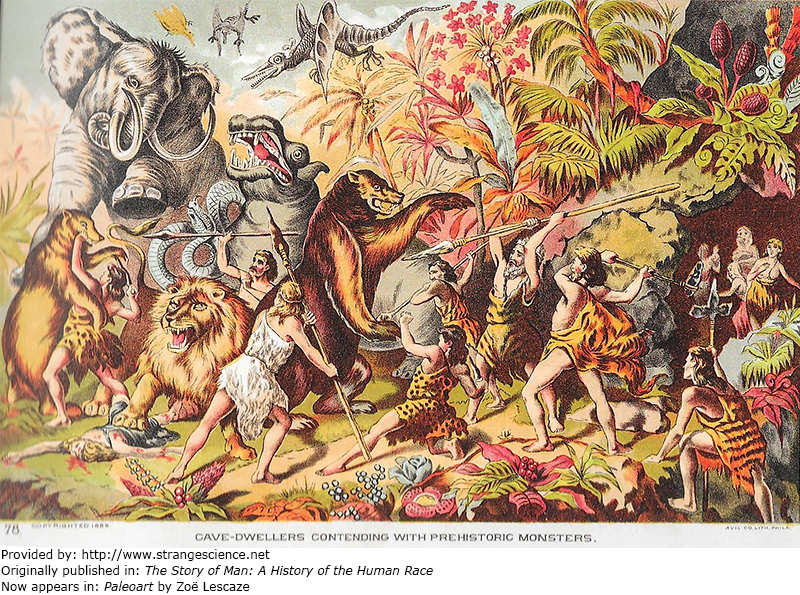 Those poor cave-dwellers had to contend with quite a lot, not only a lion splatting a hunter (lower left), but also bears, a snake with a head bigger than a human's, a chomping hippo, a stomping elephant, even a pterosaur. The pterosaur must have flown in from the Mesozoic out of sheer spite. Prehistoric fair damsels watch their men from a nearby cave. If you're used to looking at evolutionary tree diagrams, you might notice something odd about this one. This "Genealogy of the Class of Fishes" shows multiple orders of fishes appearing without apparent ancestors. On the one hand, this could be seen as a simple diagram of the diversity of fish species throughout the fossil record, and it was comprised by the indisputable 19th-century master of fossil-fish diversity. But something else was also at work in Agassiz's diagram. Agassiz was a committed creationist, who opposed not only Lamarck's ideas, but Darwin's as well. 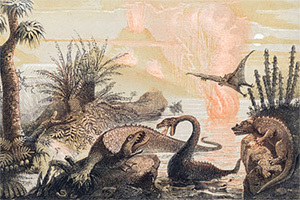 The Swiss naturalist was convinced that ancient catastrophes had been followed by new creations, and reacted with anger whenever his findings were cited as evidence of evolution. As a result, while other naturalists were trying to discern which species arose from which ancestors, Agassiz didn't give the matter any thought, convinced that God had simply made new species whenever and wherever appropriate.